This is a closeup of a very realistic, faux-finish interior "flagstone" floor created by drawing a grout pattern on the concrete with soapstone and acid-staining the "rocks" one by one. The main reason concrete floors are stained is because paint - even special concrete paint - does not adhere well, or last. Concrete stain, under a durable, clear sealer, does adhere and last, especially if the floor is cleaned and maintained. Concrete stains are also chosen instead of colored epoxy coatings, for example, because their translucency helps make concrete look like something stylish and expensive, like marble, granite, travertine, flagstone, and other forms of natural stone, rather than something merely utilitarian and functional. Decorative concrete scoring (saw-cutting) may also then be performed to create patterning effects that complement or enhance this "natural stone" appearance. Here are some of the most popular Acid Stained Concrete Scoring Patterns. There is a growing variety of concrete staining materials on the market. Acid stains, and the earth tones they offer, are the most popular, but for wider color range and variation, and greater control over detail, "tints", "concrete dyes" and "acrylic concrete stains" (water-based and solvent-based) are also used. For an illustration of the basic acid stain colors, see these color charts: : Brickform E-Stain; Artcrete Faux Brick; EZCHEM PermaPro; and CSI Chromastain . To view some of the brighter colors attainable with tints, dyes and acrylic stains on these color charts: Consolideck GemTone; Chroma-Tech Polystains; H&C Dye Stains; and Mason's Select. We use a range of concrete coloring options depending on the needs of a particular project. 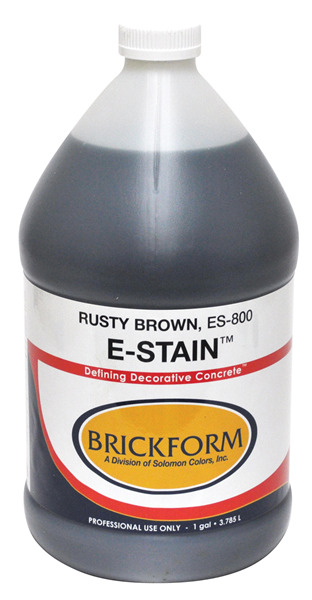 Brickform E-Stain is an eco-friendly acid stain that is considered "non-hazardous" and has no harmful fumes. Many people think of acid-staining as a do-it-yourself project, like house painting, but it's really not. It takes a considerable degree of skill and experience to avoid the easy pitfalls that can quickly ruin a stained concrete flooring project, and to achieve the natural stone effects that will make people think they're seeing something they're not. We have that skill and experience, and will bring a realistic, fluid feel to your concrete floor that will augment the ambient look and design you plan to achieve through architecture, furnishings, lighting, woodwork, and paint or wall coverings. One misnomer about acid-staining is that the products are hazardous to deal with, require special means of disposal, and are not eco-friendly. But when following the proper procedures, there is no real risk to the applicator and none at all to others nearby. Acid stains are 95% water and generally contain only 5% or less of a mild acidic solution, which is then "neutralized" upon contact and reaction with the concrete. Also, the metallic compounds that most acid stains use for coloring are commonly found in soil and fertilizer, such as iron, copper, chromium, and manganese; and unlike other building materials, acid stains contain no volatile organic compounds (VOC's), meaning there are no lingering harmful effects after application and installation. The color offerings of metallic epoxy go beyond the earth tones of acid stain, and the system has a similar, albeit less natural looking, "mottling" effect. One new "concrete staining" technology that has emerged in recent years is called "metallic epoxy". It consists of a colored epoxy base coating, into which secondary colors from metallic pigments are mixed, so as to create a swirled, "marbled", two-tone color effect similar to acid stain. We install this coating, but we generally do not recommend it, first, because it has a more synthetic and ostentatious appearance than acid stain, and second, because it is not as durable - with metallic epoxy, the color is in the coating itself, instead of the concrete. Metallic epoxy, while nice, is no substitute for acid stain.